SOIL’s crew of 92 is composed of many different teams that are all working towards the same goal: developing a sustainable model for the affordable provision of safe sanitation in urban Haiti. I want to introduce you to one of SOIL’s small, but mighty ones: the lab tech team in Cap-Haitien. What do they do? 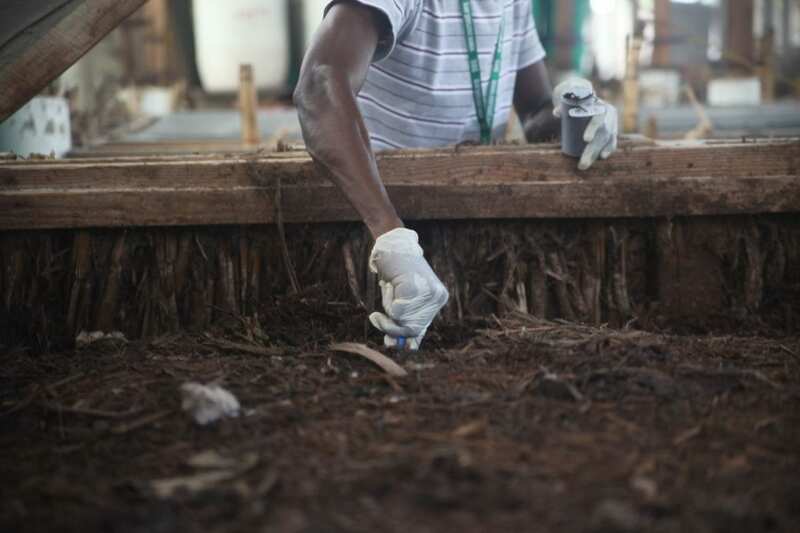 The lab team’s role is to analyze samples of waste and compost at different points in the waste treatment process to ensure our composting systems are functioning effectively and that our end product, Konpòs Lakay compost, is both free of pathogens and filled with of the nutrients needed to replenish Haiti’s badly depleted soils. They also work alongside external research partners, like Dr. Rebecca Ryals, who is currently doing comparative research on the greenhouse gases emitted from SOIL’s waste treatment site (stay tuned for an update on that soon!). For years this work had been done at SOIL’s Northern Haiti office, but hopefully soon the team will be able to start working out at the compost site itself where SOIL hopes to build a new lab facility in the coming months. It’s my pleasure to introduce you to my colleague Leno, SOIL’s Lab Technician. As a former intern at a hospital in Northern Haiti, Leno saw the impact that a lack of safely managed sanitation can have on public health at the start of his career. He shared with me that this experience is what motivates him in his work to this day. Leno explained that he’s “proud to be the one that ensures [SOIL’s] compost is free of pathogens” and that what makes him excited to come to do this work day in and day out is knowing that he’s helping to protect the environment in the area. 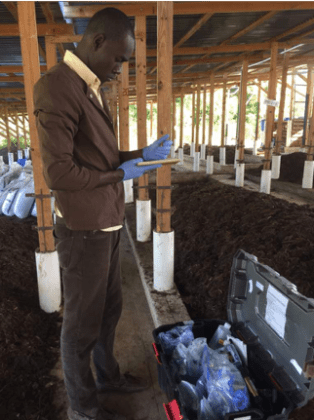 Leno, a trained lab technician, not only works to manage SOIL’s lab, but also supervises and helps train SOIL lab interns, agronomy students from local universities, in the lab processes during their time with SOIL. The internships are designed so that, even though they are short term, students will leave empowered with the experience they need to help launch their careers upon graduation. Before completing her internship, one of SOIL’s recent lab interns, Françoise, shared with me that she was most excited to have an opportunity to learn more about the natural processes that enable SOIL to generate something as valuable for the environment as compost. As SOIL fights to tackle one of the world’s most challenging problems in Haiti, we couldn’t do what we do without the dedication and commitment of hardworking team members like Leno and the interns he works alongside. Here’s to you! To learn more about recent testing done on SOIL’s compost that affirmed our composting process is safely treating 100% of waste collected from our household sanitation service, don’t miss this recent blog. We revamped SOIL’s email list last month to ensure we’re compliant with new data practice laws and that everybody on SOIL’s mailing list wants to receive our monthly updates. If you had been receiving them before but haven’t re-joined or you are interested in joining, do so today! 1 Reply to "Meet Leno, SOIL’s Lab Tech Extraordinaire"
Way to go Leno! You are quietly working for a revolution. What you are doing will eventually restore Haiti to greatness.